‘The 9th Asia Pacific Triennial of Contemporary Art’ (APT9) features a diversity of indigenous voices — the largest contingent in the Triennial’s history — who share a common experience of dislocation through European settler occupation. Brisbane-based Indigenous artist Ryan Presley looks at how the practices of five of these artists engage with the legacy of colonialism and speak to the resilience of First Nations people across the world. The broadbrush definition of the Asia Pacific in APT9 sweeps such a large swathe of the globe — from Iraq to Japan, Tasmania to Mongolia — that it requires a most attentive viewer to unravel the rich and intertwined visual cultures represented. The overwhelming common thread throughout this vast region, however, is a shared experience of the colonial exploits of European settler occupations. The curators of APT9 have not shied away from this, and the exhibition takes a thoughtful and critical perspective on Australia’s part in this colonial history of mapping, occupation of land, and maritime and currency control. More than a dozen of the 80 artists and collectives in APT9 are Aboriginal or First Nations people of their particular country, marking the highest ratio of indigenous artists ever represented in the Triennial.1 A diversity of indigenous voices is especially important in surveys such as this, which can easily stumble into previous versions of imperial showcasing of ‘expositions’ and ‘curiosities’. The presence of empire and its amphibious quality, relying upon and occupying both land and sea, is present in the recollections of several of the artists featured. The performances by the Brisbane Kiribati community feature song and dance in response to the ‘Tungaru: The Kiribati Project’ included in ‘The 9th Asia Pacific Triennial of Contemporary Art’ (APT9). Tungaru is a collaborative project inspired by the strong connections that New Zealand born artist Chris Charteris has made with his ancestral homeland and extended i-Kiribati family. The indigenous name for Kiribati is Tungaru, which means to gather together in a joyous way. Women from the Brisbane Bougainville Community Group Inc. perform a range of dances from across the Autonomous Region of Bougainville. The women are supported by Bougainville men creating the dynamic rhythmic sounds of the traditional bamboo band, but using PVC pipes and flip-flops. Women’s Wealth is an art project that engages with the ongoing importance and richness of women’s creativity within the predominantly matrilineal societies of the Autonomous Region of Bougainville and nearby provinces of the Solomon Islands. Simon Gende, from the Eastern Highlands of Papua New Guinea, is known for his paintings that provide humorous and insightful commentary on society, religion, history and contemporary events. In 2017, the Gallery hosted Gende during a visit to Brisbane so he could access the extensive government archives amassed when PNG was controlled by Australia. His interest in the Australian Government’s ongoing sway over PNG is expressed in Australia wokim nupela setelite 2018 and Gas shortage 2018. The latter work is a focused reminder of a particularly colonial trope of exploitation, referencing the nowshelved plans for a massive gas piping system to be assembled to funnel gas from PNG as far south as Gladstone, Queensland. 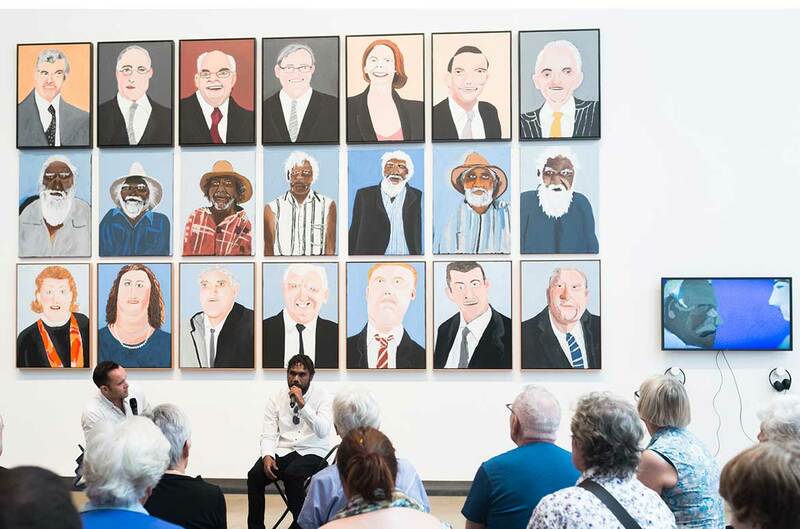 SUBSCRIBE to QAGOMA YouTube to go behind-the-scenes at events and exhibitions / Papua New Guinean artist Simon Gende known for his often humorous and insightful commentary on international events and icons discusses his artwork. Mining magnates also feature in the jocular paintings of Vincent Namatjira. Depicting seven of the wealthiest people in Australia, ‘The Richest’ series 2016 includes Gina Rinehart, who was a staunch campaigner against the tax on mining super profits. Along with a united front from her industry and lobbyists, they managed to nullify the proposed tax. A projected $12 billion in state revenue in the first two years alone has since been lost to the broader federal public.4 A perceptive curatorial ploy brings together all three series — ‘The Richest’, ‘Seven Leaders’ and ‘Prime Ministers’ (all 2016) — to give the audience a potent statement from Namatjira about the nature of power relations within the settler colonial state of Australia. In an adjacent gallery, Kapulani Landgraf’s collage works make powerful statements on indigenous experience in Hawai‘i since the United States annexed the islands in 1898. Her practice captures a contemporary indigenous view of sacred places and land issues, particularly in Honolulu, where foreign investment has necessitated dredging wetlands and clearing land to make way for high-rise, luxury apartment complexes. Lele Wale (to leap for no reason) 2016–18, in particular, addresses this desecration, and Ho’okahi Po’ohiwi (be of one shoulder) 2016–18 adds that these sorts of practices remain fiercely contested by the Kanaka Māoli people. The second work alludes to a specific event, post annexation, where the Mō’ī Kamehameha people lined their canoes along the shore of O‘ahu in an act of mass demonstration stretching from Waikīkī Bay to Wai‘alae Beach in Honolulu. The warriors then marched shoulder to shoulder, chanting as they filed towards the inland mountain range, in a display of strength and appeal for solidarity. Aotearoa New Zealand artist Lisa Reihana sees her work as a comment on Pacific Islander history, culture and tradition. 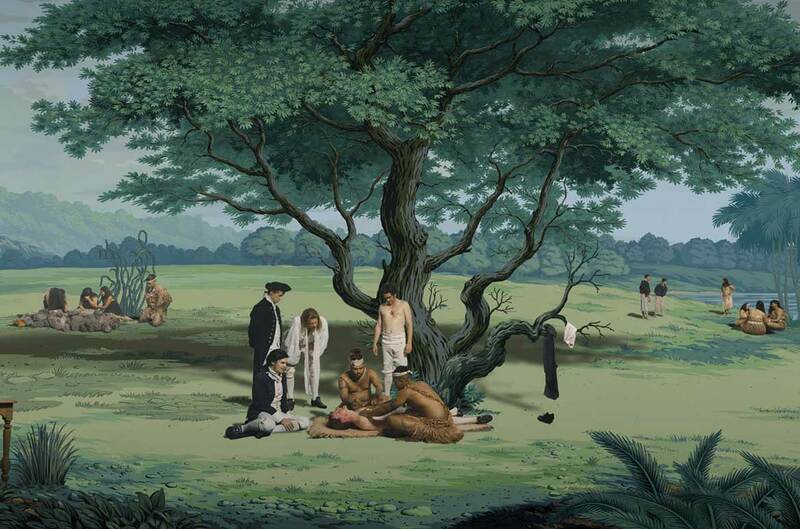 Her video installation in Pursuit of Venus [infected] 2015–17 reimagines scenes observed by Captain Cook, and accompanying voyagers, of the peoples they encountered on their multiple journeys across the Pacific Ocean. Pacific bodies often became the imagined projection of ‘Venus’ in the colonial gaze, although, as Reihana highlights, ‘it’s really hard not to exoticise something that is actually naturally beautiful’.5 In her approach, she has carefully considered how to balance competing perspectives to the global audience. 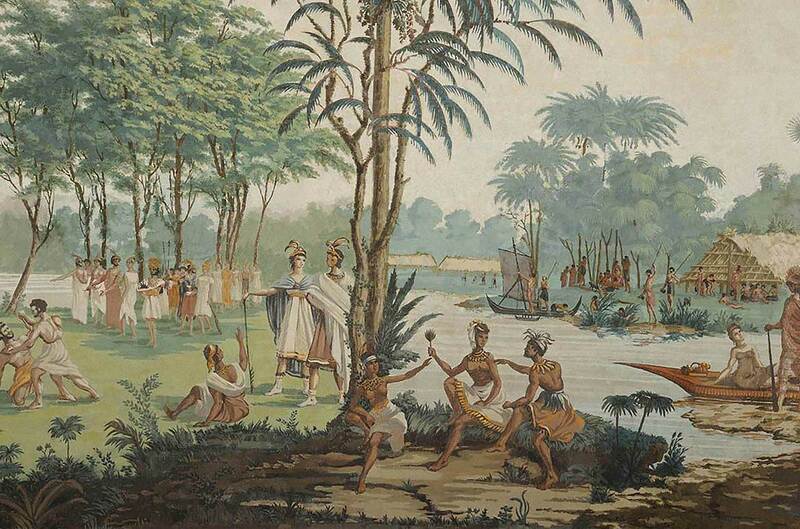 By employing Joseph Dufour’s wallpaper design Les Sauvages de la Mer Pacifique (The Savages of the Pacific Ocean) c.1804, Reihana has reactivated the panoramic tradition of ‘the expansive, all-encompassing image of the world envisaged by 19th and 20th century world expositions’.6 It is this method that necessitates work like in Pursuit of Venus [infected] for triennials such as APT9 — work that is aware of the complexities of its own production and the contexts in which it will be shown and viewed. Language is a fundamental aspect of self-representation and recollection and is subtly but powerfully deployed in the work untitled (giran) 2018 by Jonathan Jones. Viewers are struck by the swoops and peaks of the feathered tools that gracefully arc and flow across the curvature of the wall. The soundscape resonates with bird calls, pining winds and spoken Wiradjuri language. Recent histories have seen Aboriginal people imprisoned for speaking their language in public spaces, with its previous criminalisation a frequent occurrence in colonial centres of Australia.7 This was the case for the Wiradjuri people, one of the most territorially expansive First Nations groups within the south-east of the continent. 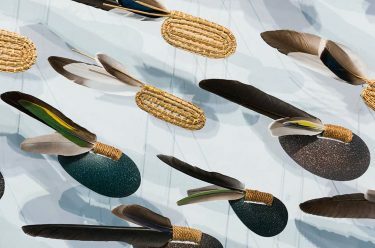 untitled (giran) features several tools important to Jones’s Wiradjuri people, such as the dhala-ny (hardwood spear point), bingal (animal bone awl) and bindu-gaany (freshwater mussel shell), each of which is attached to a variety of feathers that were donated by contributors across the country. This powerful combination of traditional tools, natural materials and language speaks to the resilience of Aboriginal peoples in the face of the changing winds of society. Collaborator Dr Uncle Stan Grant Snr has been a pivotal influence in this thread of Jones’s work, as well as in the wider community. In the New South Wales town of Parkes, more than 1000 people — ten per cent of the population — learn the Wiradjuri language every week. This initiative crosses the primary, secondary and TAFE sectors and has resulted in a rise of Aboriginal student attendance, as well as a decrease in racist sentiments held by the non-Indigenous students.8 Here lies the importance of appropriate representation of Aboriginal peoples as well as a broader public exposure. The exhibition of such work, and QAGOMA’s recent acquisition of Jones’s installation, is part of a wider educational imperative. Jonathan Jones, Wiradjuri/Kamilaroi peoples, Australia b.1978, with Dr Uncle Stan Grant Snr AM, Wiradjuri people, Australia b.1940 / (untitled) giran 2018 / Bindu-gaany (freshwater mussel shell), gabudha (rush), gawurra (feathers), marrung dinawan (emu egg), walung (stone), wambuwung dhabal (kangaroo bone), wayu (string), wiiny (wood) on wire pins, 48-channel soundscape, eucalyptus oil / 1,742 pieces (comprising 291 Bindu-gaany; 290 Galigal; 292 Bagaay; 291 Dhalany; 280 Bingal; 298 Waybarra) / Purchased 2018 with funds from Tim Fairfax AC through the Queensland Art Gallery | Gallery of Modern Art Foundation / Collection: Queensland Art Gallery | Gallery of Modern Art / © Jonathan Jones / This project has been assisted by the Australian Government through the Australia Council, its arts funding and advisory body; the NSW Government through Create NSW; and the Copyright Agency Cultural Fund. This project has also been supported by Carriageworks through the Solid Ground program. It is also worth noting that APT Kids has, from the beginning, been a key mechanism for — and a measure of — engagement, understanding and response across cultures. During the inaugural program in 1999, there was a participation record of 16,785 children. As of APT8, that has now expanded to a whopping 142,408 child participants.9 There is no doubt that this is an important programming element, especially considering Australia’s settler colonial status and the prevalence of xenophobic statements in our national discourse. 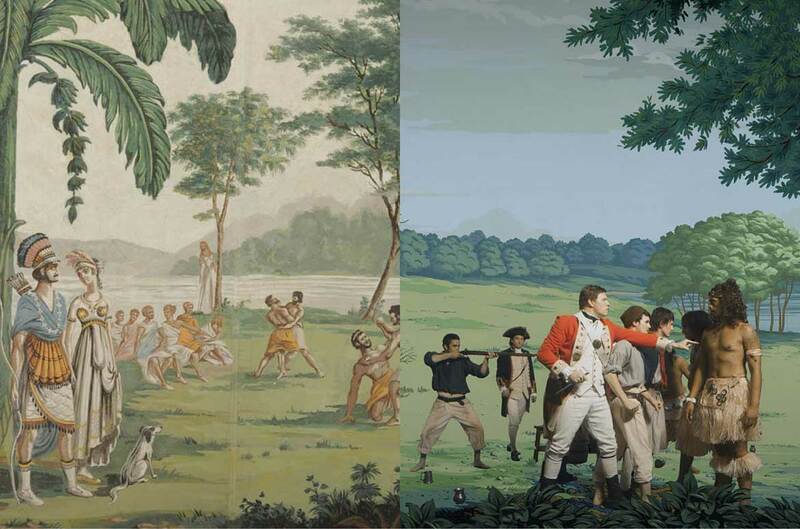 Australia’s settler heritage and historical focus on our relations with England and Europe, which has only in more recent decades been redirected towards our geographic neighbours, in no way suggests we are the natural host for the Asia Pacific Triennial. However, few would reject the statement that APT serves as an essential event for the betterment of our diverse population. 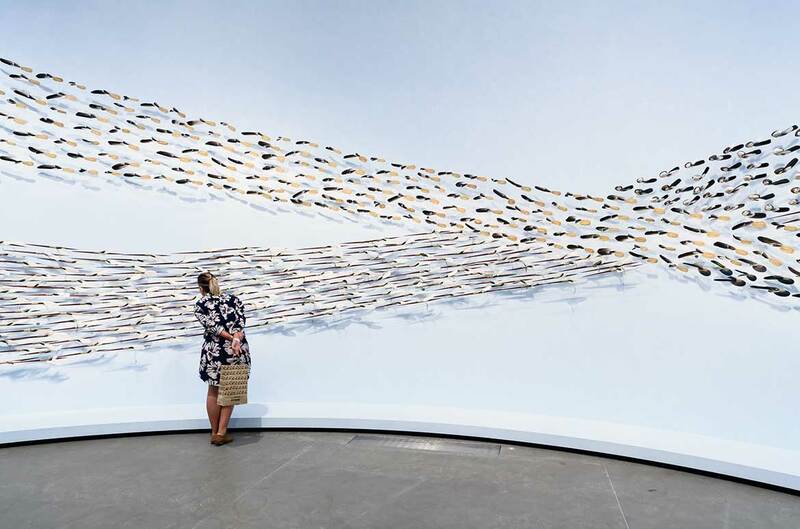 This Triennial has been carefully considered and the artists have provided thought-provoking works, with the First Nations artists’ contribution of particular and increasing relevance. In these fraught times of imperial bubbling and rupture, these works are beacons of hope and influence signalling us away from despair. 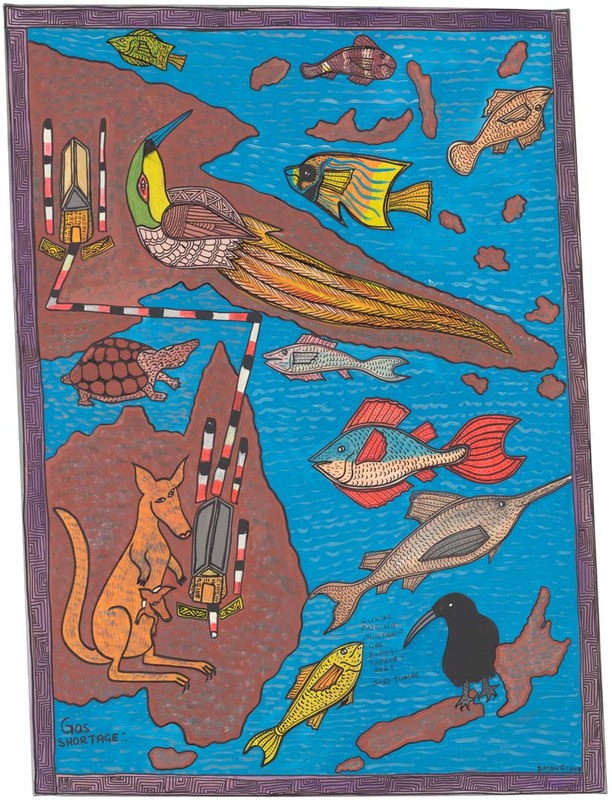 Dr Ryan Presley is a Brisbane-based artist originally from Alice Springs. His father’s family is Marri Ngarr and originate from the Moyle River region of the Northern Territory. 1 First Nations artists in APT9 include: Lola Greeno, Jonathan Jones, Vincent Namatjira, Alair Pambegan, Margaret Rarru, Helen Ganalmirriwuy, James Tylor and the Karrabing Film Collective (Australia); Simon Gende (PNG); Lisa Reihana and Areta Wilkinson (Aotearoa New Zealand); Kapulani Landgraf (Hawai‘i); Idas Losin (Taiwan); Mao Ishikawa (Okinawa); and Tcheu Siong (Laos). 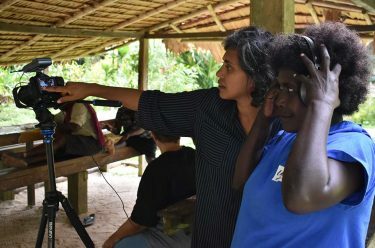 2 ‘PNG-Australia gas pipeline project suspended’, ABC News, 1 February 2007, <https://www.abc.net.au/news/2007-02-01/pngaustralia- gas-pipeline-project-suspended/2184830>, viewed December 2018. 3 Christopher Knaus and Helen Davidson, ‘Australian-backed gas project fails to deliver PNG economic boom – report’, Guardian, 30 April 2018, <https://www.theguardian.com/australia-news/2018/apr/30/australian-backed-gas-project-fails-to-deliver-pngeconomic-boom-report>, viewed December 2018. 4 See Kali Sanyal and Paige Darby, ‘Taxation – Resource super profitstax’, Budget Review 2010–11, <https://www.aph.gov.au/About_Parliament/Parliamentary_Departments/Parliamentary_Library/pubs/rp/BudgetReview201011/TaxationRSPTax>, viewed December 2018. 5 Lisa Reihana speaking in ‘Abdul Abdullah visits the Asia Pacific Triennial of Contemporary Art in Brisbane’, [THE MIX], Australian Broadcasting Corporation, 1 December 2018. 6 Francis Maravillas, ‘Cartographies of the Future: The Asia-Pacific Triennials and the Curatorial Imaginary’, in Eye of the Beholder: Reception, Audience and Practice of Modern Asian Art, eds John Clark, Maurizio Peleggi and TK Sabapathy, University of Sydney East Asian Series and Wild Peony Press, Sydney, 2006, p.251. 7 See A Dirk Moses (ed. ), Genocide and Settler Society: Frontier Violence and Stolen Indigenous Children in Australian History, Berghahn Books, New York, 2004. 8 Our Mother Tongue: Wiradjuri,, dir. Suzi Taylor, Australian Broadcasting Corporation, 8 June 2012, <https://open.abc.net.au/explore/22207>, viewed December 2018. 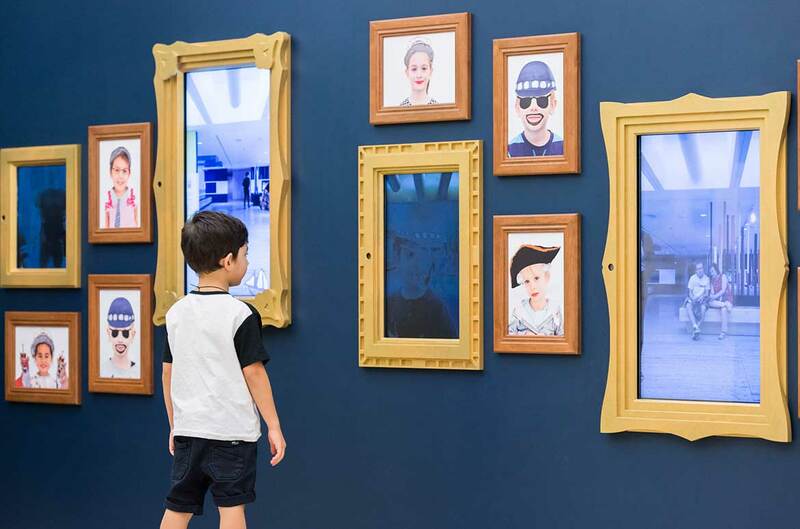 9 Statistics provided by the QAGOMA Children’s Art Centre. Does not include the touring program or additional implementation of curriculum kits. 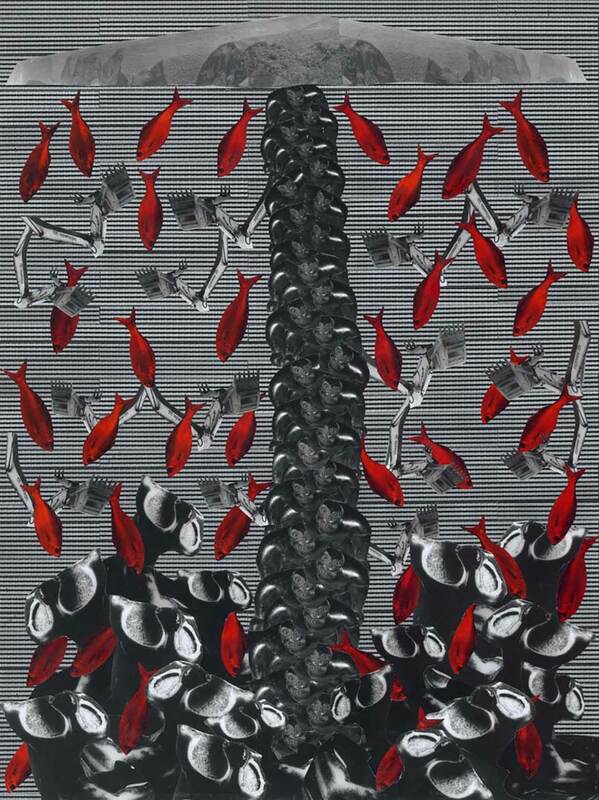 Discover more in The 9th Asia Pacific Triennial of Contemporary Art available online or in store. The publication represents an important and lasting document of the current artistic landscape of Australia, Asia and the Pacific.